Driving anywhere around Arkansas in the fall is a real feast for your eyes. It’s the perfect place to see the best fall foliage. We have a large variety of trees and a mild climate which make the changing foliage especially striking. Almost anywhere you go, colors explode in some of the most brilliant reds and bright yellows and oranges. Here’s the Taylor Team list of the top four places to see the best fall foliage in Arkansas. If you’re in for a longer road trip, consider Scenic Byway 7. It will take you through four of the state’s geographic regions. Scenic Byway 7 hits the Western Gulf Coastal Plain, the Ouachita Mountains, the Ozark Mountains, and the Ozark National Forest. These 290 miles of road is something you can’t miss if you’re looking to see the best fall foliage in Arkansas. Are you looking for a shorter drive? Add the Talimena National Scenic Byway (state route 88) to your road trip plans. The route is 54 miles. It begins in Mena and runs through some beautiful countryside. Make a stop at “the castle in the sky,” Wilhelmina State Park. Aptly named because the lodge is so high up, you’re often driving in the clouds. It’s a great, scenic spot to see the best fall foliage in Arkansas. See the best fall foliage in Arkansas from your car and the trails. Petit Jean Mountain and Mount Magazine deliver both! These two mountains have excellent hiking trails, but also lovely views from the road and turnouts. See the best fall foliage in Arkansas and some stunning vistas from the highest peaks in The Natural State. You don’t get much more beautiful than The Boston Mountains Scenic Loop to see the best fall foliage in Arkansas. Forty-two miles in all, this loop follows through the Boston mountain range through Fayetteville, Fort Smith, and Devil’s Den State Park. It has some of the best scenic vistas where you can pull off the side of the road and take in the vast array of colors. It’ll also take you through wine country. 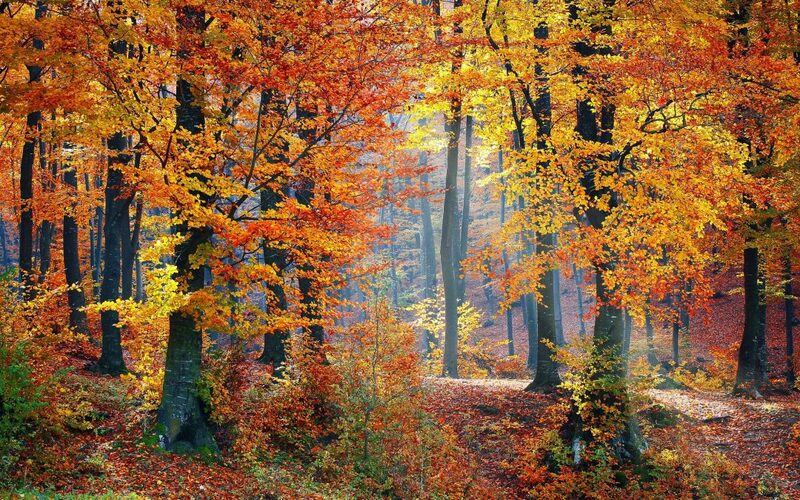 Autumn is one of the best times to appreciate the beauty and serenity of the Natural state. Even within the city limits, you can see fall foliage. Many people say that parts of Arkansas rival the colors of the New England states, especially in the Ozarks. Head over to the park or take a scenic drive to one of these places on our list to view all that autumn in Arkansas has to offer. Are you looking to buy or sell a home in the Northwest Arkansas area? Taylor Team Homes can help you find a house or sell a house today. We can help you determine property values, or how to buy a home for rookie homebuyers. We are always looking for great clients like you. Call us at (479) 668-4545 or email us at info@taylorteamhomes.com.